We have the perfect space for you. Browse our wide range of flexible and modern venues for hire. We’re dedicated to providing end-to-end excellent service. Find out about catering options, AV equipment and our recommended suppliers. There's a lot to think about when hosting an event on campus. Check out our handy hints, checklists, policies and procedures. Have an enquiry? Get in touch with our friendly team. The Campus Cinema is a tiered venue which seats 200 people and has a small foyer area. It is located on the Ground Floor (West), 21 Chancellors Walk, Campus Centre. 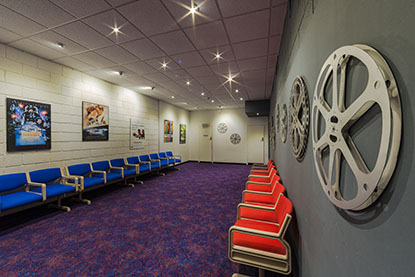 The Campus Cinema is a venue especially set up for the showing of either reel to reel films (35mm), digital films or DVDs. A Film Censorship Certificate or Exemption is required prior to an event screening. For further information regarding this please go to www.classification.gov.au. In 2016 the Campus Cinema will see the return of Art House Movies for staff and students to enjoy during lunchtimes. Authorised by: Chief Marketing Officer, Strategic Marketing and Communications. Maintained by: Venue Hire Webmaster Team. Last updated: Sep 2017.